Professor Davis's primary faculty website is here. His Ph. 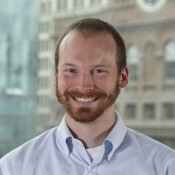 D. research focused on using mathematical and computational techniques to identify and visualize performance limits on chemical process networks. Some examples were networks of batch chemical reactors, gas liquefaction processes, PEM fuel cell networks, and power generation bottoming cycles. While at UCLA, he also studied computational methods for assessing the sustainability of corporations and other entities using fuzzy logic. His current work at Cooper Union focuses on sustainability assessment, life cycle assessment, and chemical process design and optimization.